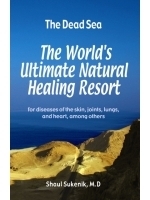 The Dead Sea - the world's ultimate natural healing resort for diseases of the skin, joints, lungs, and heart, among others summarizes knowledge on the efficacy of the Dead Sea in the treatment of a broad range of diseases. It details the different diseases that can be treated successfully at the Dead Sea and describes, in simple terms that anyone can understand, the principles, mechanisms of action and advantages upon which the various treatments that are available at the health spas are based. Prof. Shaul Sukenik is a specialist in internal medicine and joint diseases. He has served as the head of Internal Medicine Department D of the Soroka University Medical Center since 1989 and was recently appointed as the head of the Division of Internal Medicine. Over the past 15 years Prof. Sukenik has conducted research on the Dead Sea as a unique health spa site for the treatment of joint diseases and has gained an international reputation in the field of balneotherapy and health tourism. He has published over 160 papers in the medical literature.